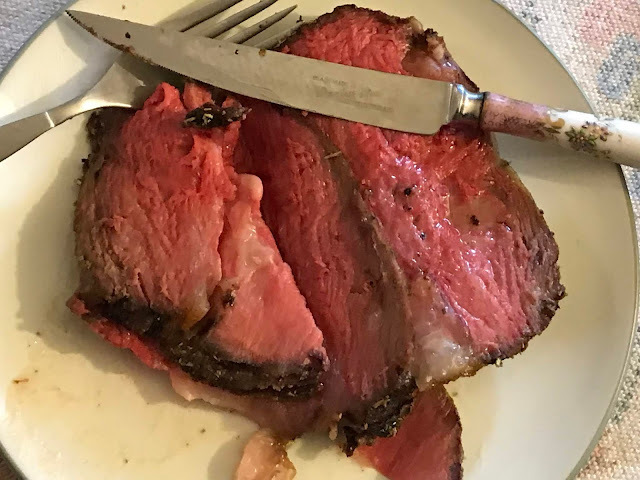 Restaurant Perfect Prime Rib Christmas Dinner! Every now and then, while preparing a meal ~ or meat in this case ~ without prior experience, nor a recipe, I hit the bullseye. 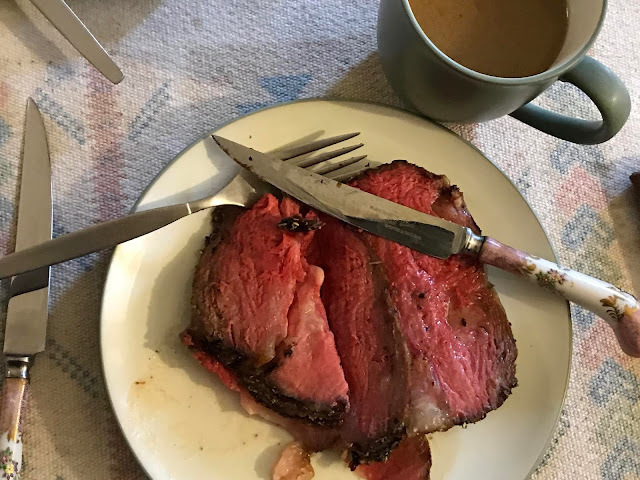 I would have to say this Prime Rib was seasoned and roasted to pure perfection ~ so much so, I impressed myself! As simple as it was, I thought I'd share the seasonings and roasting method. We happened to pick this Prime Rib roast up for a smoking deal. It was between 6-8 pounds, and cost less than $4 per pound. I've never actually prepared Prime Rib before. It was my dad's favorite. I enjoyed it well enough, but I wouldn't say it ever really wowed me. However, at that price, who could refuse. It seemed ideal for our Christmas day meal. And, it was. 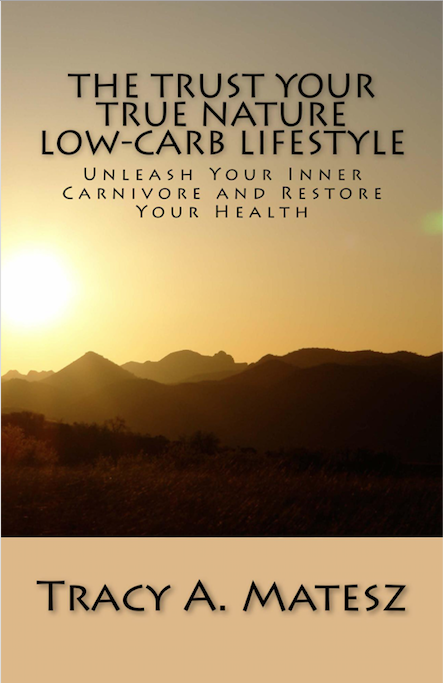 Given our uber simple way of eating, we often don't prepare much other than the main course. I did happen to have some of my Sugar-Free Cranberry Apple Sauce made previously, and never bothered! Our 'treats' are either a little dark chocolate, and/or some goat cheese for me ~ especially loving the Trader Joe's goat cheese logs, rolled in dried fruit ~ or Munster cheese for Don. However, the Cranberry Apple Sauce is good with either cottage cheese, yogurt, or sour cream. Of course, fill in the side dishes with whatever you like. In our plants optional approach, little is required to provide satisfaction, but each person will need to make sure to include what provides the best personal satisfaction, and desired health goals. Place rosemary, fennel seeds, and onion flakes in a coffee grinder, designated for grinding spices (or just make sure it's clean and dry.) Either pulse, or grind for a quick minute to just break up the spices, and release the aromas. You can use all previously ground spices, but this will be more aromatic and flavorful. If using a suribachi, grind until the spices are broken down, and aromatic smelling. Place ground spices in a small bowl, and add salt and pepper as desired. Stir to combine. Remove roast from packaging, and cut twine. Place in roasting pan. Rub the spices all over the meat. Place in heated oven for about 10-15 minutes, or until just beginning to brown. Pull the oven rack out, and carefully add bone broth. I usually have a nice layer of fat at the top of my bone broth, which I remove, and place on top of the roast. Since the pan is hot, it will splash and make a noise, so do be careful. I just prefer to brown it in a dry pan first. 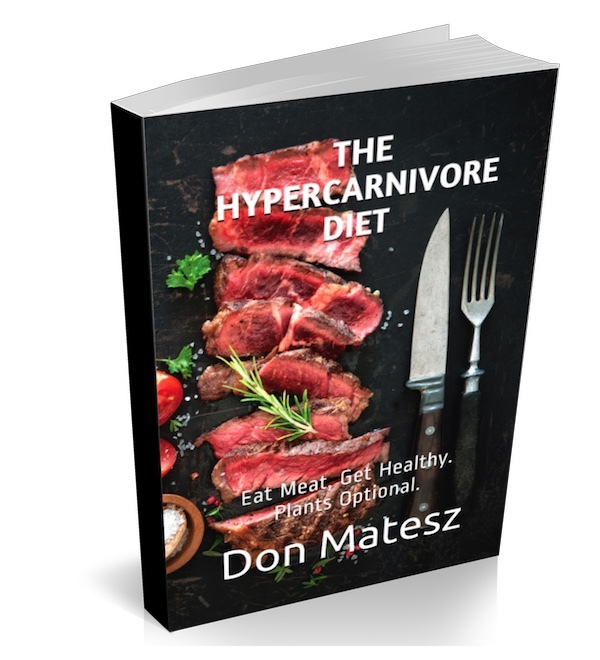 Turn heat to 200-225º and roast until internal temperature is 120-125º for medium-rare. We started our roast around 8:00 am, or thereabouts, and pulled it out around 12:30-12:45, so it took a total of 4.5-5 hours roasting time, including starting at the higher temperature. It came out unbelievably tender and perfectly seasoned. I nearly forgot. I made a fresh batch of Pressure-Cooked Beef Bone Broth, to which I added a small handful of dried rose hips, dried cranberries, and seaweed. We had broth with our Prime Rib. a wedding gift. They cut through this Perfect Prime Rib like butter! We were out of horseradish, but mixing horseradish with sour cream is excellent with Prime Rib! And, I did buy a russet potato to bake for myself, and completely forgot to bake it! This way of eating could not be simpler! We had Coffee with Keto Kreme first ~ which really provides staying power until ready for a meal. After taking our Christmas Morning cold pool plunge, we enjoyed our Basic Bacon & Eggs ~ eating light in anticipation of our Prime Rib Christmas Eve Dinner. You can see our entire Christmas Eve dinner, and our Christmas Day cold pool plunge in the video below. 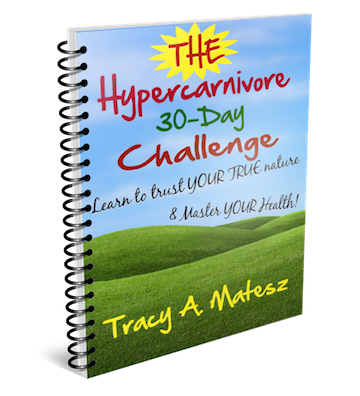 Ready to take The 30-Day Hypercarnivore Challenge? You will be amazed at what you discover! Which foods support, and which foods negate your health may be quite different than you believe! 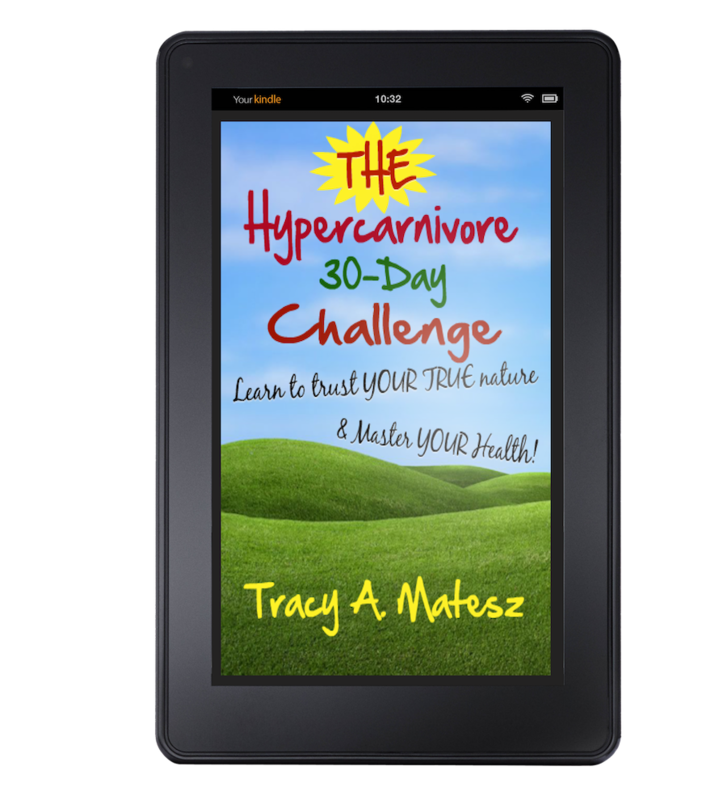 Download The Hypercarnivore 30-Day Challenge TODAY FREE! Please note, I may be creating a newsletter soon. I would never inundate your inbox, but want to be able to alert you to any future book releases, special subscriber offers, private content, and possible future forum!